I’m scheduled for a flight attendant interview on Tuesday! I’ve been through the process once before so I am familiar with the questions they may ask, but I’m just not confident in my answers sometimes. The hardest part is answering behavioral or situational questions. When they ask, “Name a time when…” I find it really hard to recall examples from my past work experience. I have trouble with these questions and I’m not sure what a good answer may be. I hope you can help. Here are a few examples. 2. Name a time when you were under a lot of stress and how did you deal with it? 3. Describe a situation when you had to make a quick decision? You’ve been through the interview process once before, so you already know what to expect. That’s half the battle. Try to relax and don’t forget to smile. Being able to keep your cool during a stressful situation is a big part of the job. The fact that the airline called you for a one-on-one interview says a lot about you. Thousands of people apply for the job, but very few applicants hear back from the airline. Remember that next time you’re not feeling overly confident. And try to have some fun. When it comes to answering interview questions, the most important thing to do is let the airline know you’re a customer service oriented person – as often as possible. Talk about how you go above and beyond the call of duty to help people. 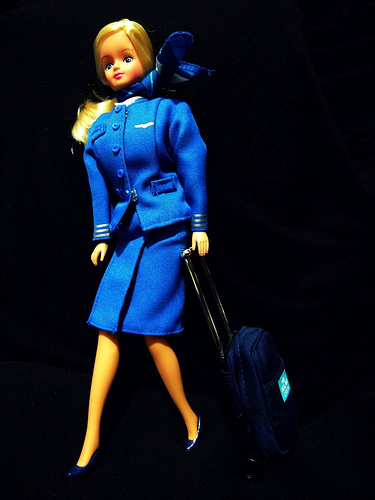 Airlines are looking for flight attendants who are friendly, work well with others and take pride in their job. Try not to read too much into the questions. There’s no such thing as a right answer. You don’t have to share life-altering events for an airline to realize you’d make a great fit. Think in terms of the job. Keep it simple. If there were correct answers to these questions, the answers would be somewhere and you could look them up. The questions are very likely 30% about what you say, and 70% about what information is between the lines. They’re trying to discover who you really are, not what you would really do. A great way to prepare for an interview like this (… and who wouldn’t want to prepare?? …) is to figure out what the job entails (… you know this …), what you have to bring to the job (… you know this, too …), that you’re already good enough to get the job (… maybe work on this …), and that this is the job you absolutely, positively want and can do it better than anyone else (… work on this, too …). And sleep at a Holiday Inn Express (… just kidding … 🙂 ). Another “trap” is that sometimes they provoke people into admitting that they want to move up, go into management, etc. This is NOT what they’re looking for. Yes, if you are interested, great, but right now you’re hiring to be a +Flight Attendant+, not a manager or supervisor, and they want someone who fits the bill. Too many leaders are like too many cooks. It can spoil the meal. They need people who can work with other people, who cooperate and follow directions. “Sheep”, if you will! Great tip someone gave me once, be nice to everyone and be aware they’re watching you at every step. Strike up a conversation in the waiting area. Be friendly with the airline’s security people. Also, you might want to add tips about surviving those deadly group exercises. Did you have to do those during your interview?? I passed successfully for three major airlines and every person I “instructed” succeeded in their interviews. Hello ,i want to become an air-hostess ,when i turn 21 . Can someone explain what to expect from the group exercises ? 🙂 Thank you for any response.